Provide comfort for the family of Dorothy Marshall with a meaningful gesture of sympathy. 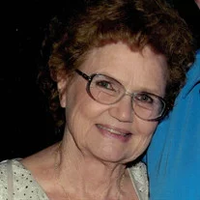 Loco - Graveside services for Mrs. Dorothy Lee Marshall will be held 2:00 P.M., Saturday, March 30, 2019 at Loco Cemetery with Terry Bradley officiating. Services are under the care and direction of Alexander Gray Funeral Home in Wilson. Mrs. Marshall was a homemaker and a member of Kingston Assembly of God. She was preceded in death by her first husband, Harold Bradshaw; son, Keith Wayne Bradshaw; granddaughter, Christie Peck; great granddaughter, Riley Kate Gunter; her parents, Alex Thompson and Lucy Wallace Thompson; and siblings. Those left to cherish her memory are her husband of eight years, Ben Marshall; two sons, Joe Bradshaw of Laurel and Billy Bradshaw of New Mexico; daughter, Cheryl Peck of Laurel; grandchildren, Jenny Gunter and Michael Peck both of Laurel, Brittani Leach of Oklahoma, and Logan Bradshaw of New Mexico; great grandchildren, Alley Gunter, Presley Gunter, Addy Peck and Gabby Peck; brother, Jessie Thompson of Texas; and sister, Irene Dixon of Oklahoma. To send flowers in memory of Dorothy Lee Marshall, please visit our Heartfelt Sympathies Store.